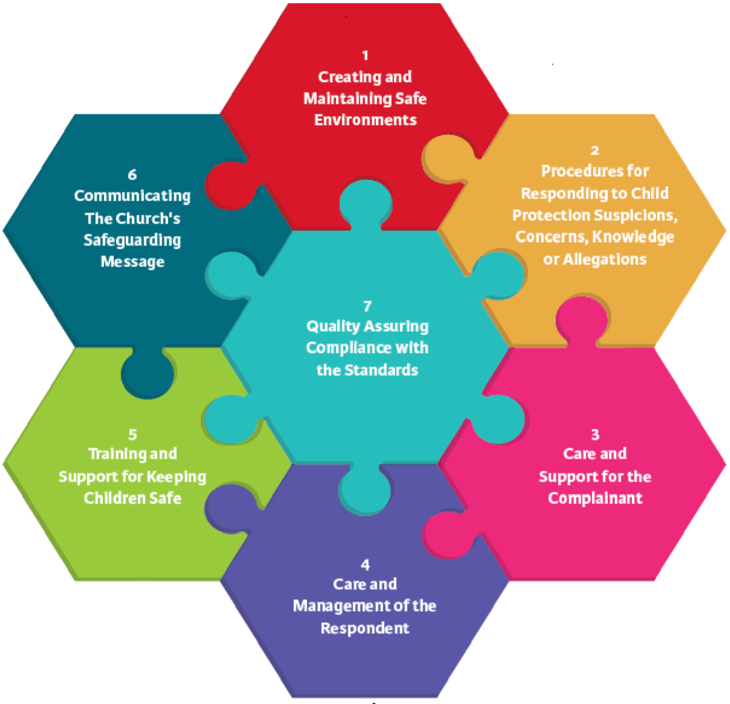 In 2008 the National Board launched the Standards and Guidance document which first introduced a set of set of seven standards representing best practice in the area of safeguarding children. In 2016 the National Board, in its more comprehensive and definitive set of guidelines, adapted and updated the previous standards in a document that we are now calling The Seven Standards. The diagram above, frChruchom the National Board documentation demonstrates clearly both the inter-relationship between the various standards and the unity of purpose in safeguarding children that they represent. The Christian Brothers European Province, through its personnel, staff, ministries and activities, complies with all applicable indicators of The Seven Safeguarding Standards. Everyone involved in the mission and work of the Christian Brothers European Province has a role to play in creating an environment in which children can develop and be safe. Guided by this standard, we are committed to providing an environment for children that is welcoming, nurturing and safe. We provide access to good role models whom the children can trust, who respect, protect and enhance their spiritual, physical, emotional, intellectual and social development. Clear procedures and guidance on what to do when suspicions, concerns, knowledge or allegations arise regarding a child’s safety or welfare exist. They will ensure that there is a prompt, effective and appropriate response. The also enable the Christian Brothers European Province to meet all legal and best practice requirements, both national and international. Complainants who have suffered abuse as children receive a compassionate response when they disclose their abuse. They and their families are offered appropriate support, advice and pastoral care. The Church Authorities has in place a fair process for investigating and managing child safeguarding concerns. When the threshold for reporting has been reached a system of support and monitoring for respondents is provided. Our personnel are trained and supported in all aspects of safeguarding relevant to their role, in order to develop and maintain the necessary knowledge, attitudes and skills to safeguard and protect children. We communicate appropriately the message of safeguarding children. We have in place arrangements to ensure and evaluate our compliance with the safeguarding standards.